Nearly one in four active duty service members and veterans want to open and operate their own business. Opportunity, freedom, and solving problems attract them to the challenge of owning a business. If you’re looking to join the ranks of the 2.4 million military veterans who run their own business (U.S. Census), we can assist you. The UCF Business Incubation Program recognizes veterans are equipped with a powerful set of skills including leadership, striving for excellence and completing the mission. Through the incubator’s Veterans Initiative, we help veterans realize and leverage those skills in an entrepreneurial setting. Whether you’re veteran looking to explore an idea for a potential business or need help scaling your existing company, Our Mission is to empower and support veteran entrepreneurs through business guidance, education and mentorship. If you’re a veteran entrepreneur, we want to hear from you! Please visit our website at www.vei.center. If you’re interested in participating in our Advanced Program, please complete the Application Form Here. Through our partnership with Veterans Florida, the Veterans Florida Entrepreneurship Program offers qualified veterans a tuition-free, online and on-campus instruction designed to match up with your level of knowledge and your busy schedule. The program provides three pathways of instruction. The first pathway comprises online lessons that will familiarize you with basic terminology and concepts. The second pathway offers specialized workshops held on the campuses of our six academic partners. The third pathway is an advanced on-campus program that delves more deeply into all aspects of entrepreneurship. Learn the basics of entrepreneurship at your own pace with our online curriculum. Perfect for veterans contemplating entrepreneurship. Open to all vets. Bi-monthly workshops held at UCF Business Incubation Program. Ideal for those with early-stage ideas or companies. Open to all vets. Our workshop schedule can be found at www.vei.center. 60 hours of in-class training held at one of our six participating institutions of higher education designed to prepare participants for all elements of entrepreneurship. For veterans with well-defined business ideas or early-stage companies. Veterans learn to test and validate their ideas or business concepts using the Business Model Canvas and Lean Startup Methodology. Acceptance required. The advanced program will take place from January to March 2019, please complete the Application Form Here. 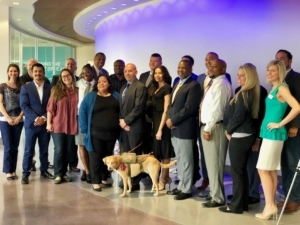 Veterans entrepreneurs gain access to the region’s entrepreneurial ecosystem and support network through one-on-one coaching and ongoing workshops on topics relevant to emerging businesses. If you would like to set up a one-on-one meeting, please connect with us at www.vei.center. Briefly describe your business concept. Which of the following steps have you taken towards launching your business?